Martin Shkreli, the former hedge fund manager vilified in nearly every corner of America for buying a pharmaceutical company and jacking up the price of a life-saving drug more than fiftyfold, was arrested Thursday on securities fraud charges unrelated to the furor. The boyish-looking 32-year-old entrepreneur -- an unapologetically aggressive businessman and relentlessly self-promoting figure who has called himself "the world's most eligible bachelor" on Twitter and recently plunged into the hip-hop world by buying an unreleased album by the Wu-Tang Clan and reportedly promising to help have jailed Brooklyn rapper Bobby Shmurda bailed out -- was taken into custody in a gray hooded sweatshirt and awaited an appearance in federal court in Brooklyn. He was charged in a seven-count indictment unconnected to the drug price hikes imposed by his company, Turing Pharmaceuticals. The charges instead involve his actions at another drug company, Retrophin, which he ran as CEO from 2012 to 2014. The indictment said Shkreli and others orchestrated three interrelated fraud schemes from 2009 to 2014. It said they fraudulently induced investors to sink their money into two separate funds and misappropriated Retrophin's assets to satisfy Shkreli's personal and professional debts. Shkreli "engaged in multiple schemes to ensnare investors through a web of lies and deceit," U.S. Attorney Robert Capers said in a statement. Shkreli was charged with securities fraud and conspiracy. His attorneys had no immediate comment. A second defendant, lawyer Evan Greebel, of Scarsdale, New York, was charged with conspiracy. It was not immediately clear who would represent him. If convicted, both men could get up to 20 years in prison. Shkreli has found himself at the center of a firestorm over drug pricing in the last few months, and he hasn't been afraid to throw on more fuel. It began after his company, Turing Pharmaceuticals, spent $55 million in August for the U.S. rights to sell Daraprim, a 62-year-old drug for a rare parasitic infection, and promptly raised the price from $13.50 to $750 per pill. The drug is the only approved treatment for toxoplasmosis, a disease that mainly strikes pregnant women, cancer patients and AIDS patients. The move sparked outrage that resounded from the presidential campaign to the punk rock world and turned him into the new face of corporate greed. Doctors and medical groups said the price hike was cutting patients off from lifesaving treatment, activists protested outside Turing's offices, and the episode helped prompt a Senate hearing on drug prices. Hillary Clinton called it price gouging and said the company's behavior was "outrageous." Donald Trump called Shkreli "a spoiled brat." Bernie Sanders returned a donation from Shkreli. And indie record label Collect Records said it was severing ties with Shkreli, who had been an investor. 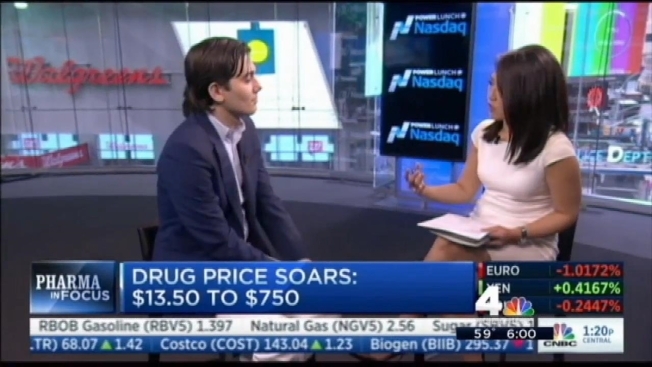 Shkreli said the company would cut the price of Daraprim. Last month, however, Turing reneged. Instead, the company is reducing what it charges hospitals for Daraprim by as much as 50 percent. While most patients' copayments will be $10 or less a month, insurance companies will be stuck with the bulk of the tab, potentially driving up future treatment and insurance costs. Shkreli has said that insurance and other programs allow patients to get the drug despite the cost, and that the profits are helping fund research into new treatments. But he has also unapologetically emphasized a business-is-business argument for the price jump. In fact, he recently said he probably should have raised it more. "No one wants to say it, no one's proud of it, but this is a capitalist society, a capitalist system and capitalist rules," he said in an interview at the Forbes Healthcare Summit this month. "And my investors expect me to maximize profits, not to minimize them or go half or go 70 percent but to go to 100 percent of the profit curve." Meanwhile, Shkreli's public profile added another dimension when it recently emerged that he bought the only copy of a Wu-Tang Clan album titled "Once Upon a Time in Shaolin," which the group sold on the condition that it not be released publicly. He said he paid $2 million. In August, Retrophin sued Shkreli for more than $65 million, accusing him of using his control of the company to enrich himself and to pay off the claims of financial fund investors he had defrauded.